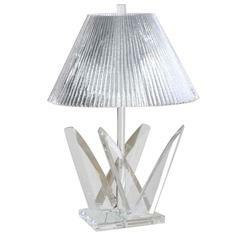 Very chunky Lucite lamp. Features stacked solid Lucite blocks, both clear and frosted with polished edges and oval forms. Has original diamond shaped Lucite finial. Linen shade has wear consistent with age and use. 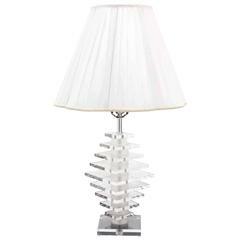 Single tall Lucite table lamp, this lamp is a Vintage piece of Mid-Century Modern Design, this item is on sale for a clearance price. 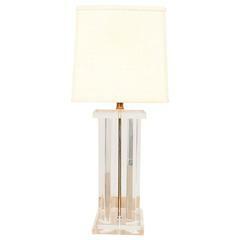 Vintage Lucite column table lamp. 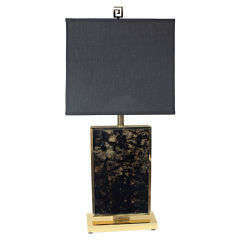 Very nice Mid-Century Modern Lucite table lamp. 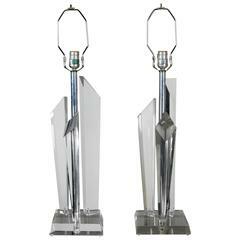 Very nice Lucite tusks motive Mid-Century Modern table lamp. 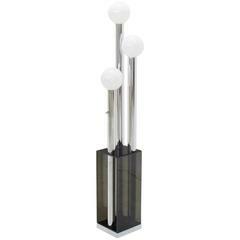 Stunning Lucite stacked table lamp from the 1970s. Gorgeous lines. Wired for USA. 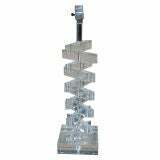 The actual stacked Lucite section of the lamp is 15 inches tall and all other dimensions are below.